From Saturday 4th to Monday 27th November 2017. 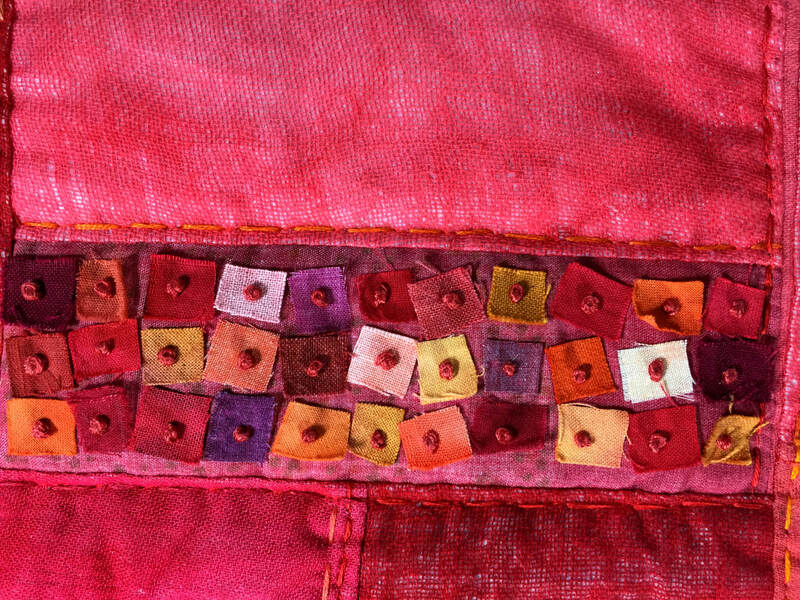 Inner Journeys: Five textile artists, each with five. 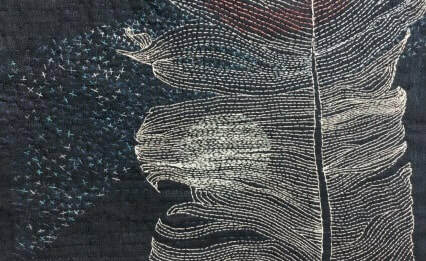 The exhibition was one of several fibre arts exhibitions presented at the Stitches and Craft show in Adelaide in November 2016 and has toured to several venues in Australia and New Zealand during 2016-2017. Linhay gallery hosts the final showing of this work. The five members of SAlt - Judy Bushby, Julie Haddrick, Francie Mewett, Sara Bell Smith and newcomer Wendy Thiele – worked to a common theme of Inner Journeys and a standard size of 36 x 120 cm (16 x 40 inches). The broad-based theme provided many opportunities to explore personal issues and perhaps journeys of the mind. Each artist developed a personal sub-themes and worked independently to create a suite of five wall textiles designed to be displayed together. Finding one’s identity and creative, emotional or spiritual home can be a lifelong journey and each fabric piece is very personal. This exhibition at times confronts yet can reveal the hidden power of one’s inner journey as each of the five themes unfold: physical journey, emotional journey, spiritual journey, creative journey and the journey of discovery. Julie Haddricks’ theme Look Deep Into Nature is inspired by Albert Einstein’s adage to ‘Look deeper into nature and you will understand everything better’. A lifetime of bulging pockets, collecting the discarded, used or broken, saving the treasure of every walk, is evidenced in Haddricks’ five textiles pieces. These reflect her connection with nature, particularly discarded objects such as feathers, sticks, and ceramic shards which she interprets into new genres, much like a painter. 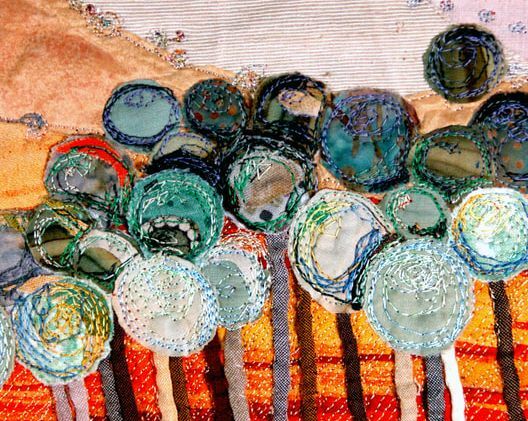 Haddricks’ fine art training in drawing, painting and printmaking shapes the way she works, using colour and stitch, threads, paint and cloth in sparse, refined ways without elaboration. "Look deeper into nature and you will understand everything better." Batik is Mewett’s preferred background fabric for each panel which she intuitively hand-stitches prior to adding decorative machine appliqué. Further hand embroidered embellishment is added using a variety of embroidery threads and wools to achieve the rich, textured look. Francie builds up layers of what seems to be a simple, graphic, yet richly-embossed surface. The desire to touch is a frequent response to her beautiful work. Living with Cancer is the body of work representing Judi Bushby’s inner journeys as she comes to terms with losing family and friends or accompanying others as they continue their battles with this dreaded disease. She finds that watching on is heart-wrenching and both physically and emotionally draining. Cancer is everywhere, all pervasive, and seems on occasion quite random and Judy feels that medical research and hope for cures provide encouragement for everyone to keep fighting. 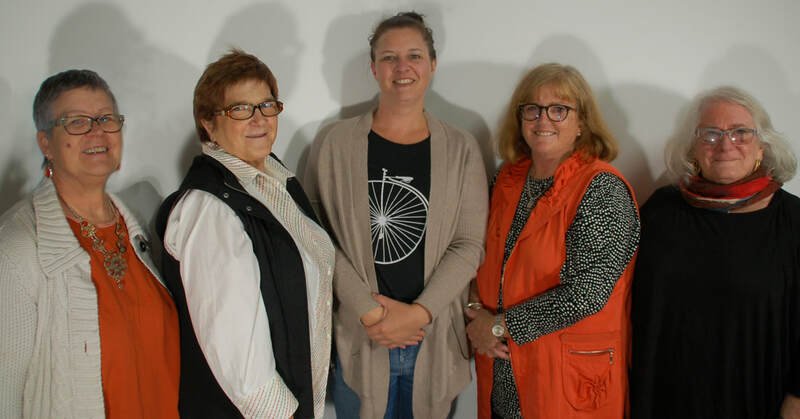 In 2014, Sarah Bell Smith made two life-changing decisions: to move interstate to the country closer to her frail and ageing parents, and to give up the teaching career which had provided great satisfaction, good friends and a secure lifestyle. The colour red expressed her feelings, her strength, passion, fire, energy and love during this period of transition and upheaval. In her theme Stitching Red! 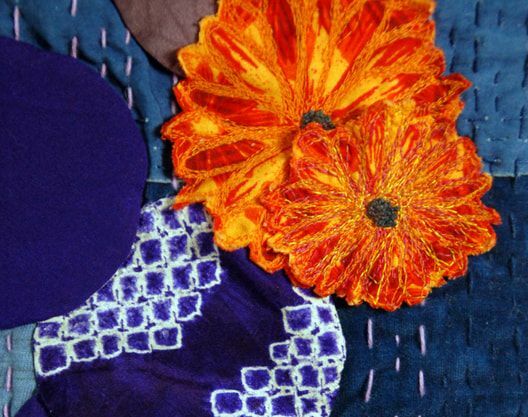 Sarah creates smaller fabric units stitched by hand or machine, which are then combined to create a larger picture, something she refers to ‘as paralleling the human experience’. Wendy Thiele’s heart is in the tropics, her feet in the desert; such are the physical wanderings throughout her life. Wendy’s inspiration for Inner Journeys - Channelling Fred is the intensity, colour, light, heat and age of the arid lands of her home in Port Augusta, S.A. Travelling the physical road regularly for work, Thiele was inspired to incorporate the style of her favourite Australian artist Fred Williams into her stitched landscapes. Painter and printmaker Williams’ sought an aesthetic language with which to express Australia’s unique landscape and so adapted the approach taken by Aboriginal artists to better represent country. 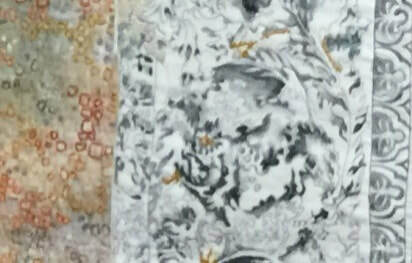 Thiele created her landscapes with vintage kimono silks and enjoyed the challenges of using the Japanese palette to describe the Australian bush. Intimate details like ancient fossils found throughout the Flinders are stitched in the background quilting. Excerpts from Exhibition Review by Julie Haddrick for Tetxtile Forum Magazine. Sarah Bell Smith 'Discovery' detail.